First Arab Spring elections are to be held in Tunisia on Sunday 23 October 2011. nonfiXe went to smell the Jasmine of the uprising and temp the ambiance. 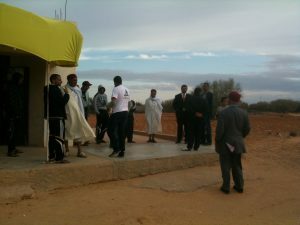 Reportage about campaigning Khaled Chouket in the rural region Bir Ali, Sfax. 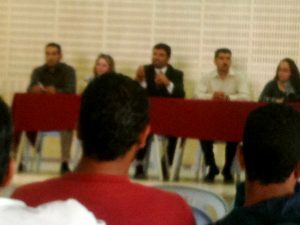 A blond unveiled middle-aged woman is seated next to Khaled Chouket at the meeting of Almajd party – party of Glory – in Sfax, Tunisia on October 16, 2011. She doesn’t speak during the meeting attended by some fifty people, most of which still haven’t made up their mind on who to vote for. 116 Parties have joined the Tunisian election for a national assembly that will write the country’s new constitution. Election date is on Sunday 23 October 2011. After the meeting the blond walks around disorientated, while party leader Chouket talks to a Dutch television crew. When asked her opinion she states that women’s rights need to be protected. Nothing more, nothing less. She just repeats her words like an old gramophone that got stuck. Apparently she was chosen for her looks; not too young, not too old, and not wearing a veil. This to modernize the scenery. Chouket wants to beat the uprising of the Islamic Ennahdha movement that is predicted to win a majority in tomorrow’s elections in Tunisia. And he knows that should Almajd win, there will be only one seat in the assembly, his seat. ‘I’d like to become minister of Culture,’ the president of the Rotterdam Arab Film Festival states later when we join him in the car for a campaign trip to rural area. Khaled Chouket of Tunisian/Dutch origin returned to his country of naissance back packed with European university education and politics. In Rotterdam he was a member of the city council for the left party Groen Links. 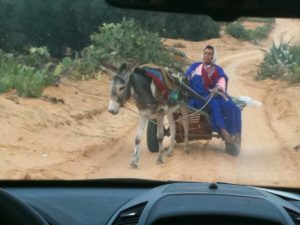 ‘They have a good opinion on migrants,’ Chouket states driving out of Sfax direction Bir Ali. Now Chouket is the leader of the liberal Almajd, number 11 on the Tunisian election list. On the way his father and other family members join in another car. ‘I have a family of 70.000, we will go there to convince them to vote for me. My great grandfather Ali Ben Khalifa led the first uprising against the French in 1881’ The politician is blazing with confidence while we drive through amazing landscapes. ‘My agenda in Tunisia is not leftwing, because I think Tunisia needs something different. We need to invigorate the democratic base and cultural freedom. In Tunisia there is no tradition of dialogue.’ In the back of the car I wonder why a left politic vision should not be able to form the base for free politics and culture. How is it possible that a left politician in Europe turns right as soon as his feet touch Maghreb ground? How can he behave as directive as Chouket does, telling people what to think without listening to what they want to say? But I don’t get the chance to ask these questions. We stop. 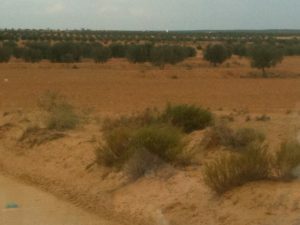 Apparently the guide took a wrong turn, which is not surprising in this sandy, pre-Sahara area with no paved roads. While Chouket argues outside with the drivers of the two other cars, Facebook activist Emna Dabbech takes notes in Arabic next to me in the back of the car. The 21-year-old student that marched day and night in the danger zone of the threatened Ben Ali regime looks disappointed with this Dutch politician. He doesn’t live up to the expectations. He is ‘ancien politique’, old politics, she whispers in my ear. When we finally stop, it is at a small building, some kind of shop, next to which a few men stand waiting. Mongi Farhani, who has been filming Chouket at the drivers seat, jumps out of the car for footage: Chouket with members of his tribe talking politics. An angry young man enters the scene. He doesn’t want to be filmed. ‘What are you doing here? In your fancy suit, with your good education and your shiny car? Where were you when we suffered?’ The other men are silent. Chouket is taken by surprise. Anger rises through his veins. ‘I was invited to come here to talk to you.’ Unable to veil his anger he starts to shout. ‘Why don’t you shut him up?’ he asks the party in high tone. ‘I don’t need your votes!’ The others stay silent. Maybe they agree with the youngster. After some minutes of shouting the quick tempered politician drives away, gassing madly. One of the elders stops him and apologizes. Chouket blazes back, shouts about a dirty street dog and a clochard insulting him. He doesn’t get his act together and drives off like a spoiled child that did not get his way. The darkness is vast and silence can be heard when we enter a small village. Emna and I are led to the women, while men gather around Chouket. ‘Do you want to sit with the women?’ she asks. ‘We’ve seen enough of the men, don’t you think?’ The room is colourful but poverish. 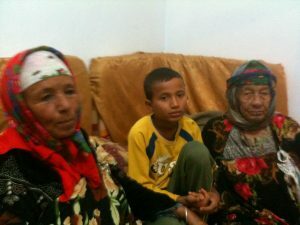 Dawazleil, 63 years old, sits on the mattress behind a small coal fired teapot with her mother in law next to her. The old woman’s face is tattooed with tribal signs that paled through the 92 years of her age. Ablasize smiles friendly while her daughter in law asks Emna if I am going to be the next president of Tunisia. 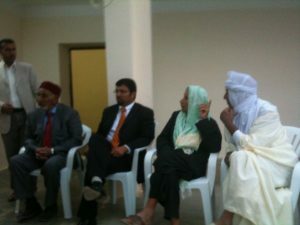 ‘Presidents are always accompanied by translators,’ she explains and agrees to talking to us and having pictures taken. Her grandson enters the room and we get cola and cookies. The women explain their situation. The house is cheap, one TDN per month. But life is expensive and they earn 5 TDN – €2.50 – a day breaking their backs in state-owned olive plantations. In this area there are no public services, garbage roams the unpaved streets, there is no sewerage, no water tap. If they have to go to the hospital it takes at least an hour to get there. No, they will not vote. They are not registered in this village of 500 people. Or, in the words of Chouket, ‘250 voters’. A loud voice from the other room indicates that Khaled Chouket is spreading his mission. Some men leave the gathering and join us. ‘Help this boy. His father died thirteen years ago,’ one of them pleas with me. ‘His name is Mohamed Emile. He needs education. He needs food. He needs a future. When it rains, he can’t go to school, because the roads are flushed, buses don’t drive and school is too far to walk. When we need to travel, we travel by animal.’ The boy smiles shyly. ‘Talk to the politician.’ The man shakes his head. He has no confidence in politics. Almajd gathering in Sfax, Rural area region Bir Ali, small shop where men awaited Khaled Chouket, Chouket and family members, Albasize, Dawazleil and Mohamed Emile in their house, traffic in Bir Ali region. Source material for the novel ‘Asfour, on betrayal’ by Caro Sicking.